How to Register with Bulk SMS Malaysia - lowest price & most reliable Bulk SMS marketing tool, 2 way sms Malaysia, works with Bulk SMS Singapore, online sms solution, web sms marketing. Register for iSMS Account now! Welcome to iSMS Malaysia and thank you for choosing to register with iSMS Online Service. This quick and FREE registration allows you access to the membership page. 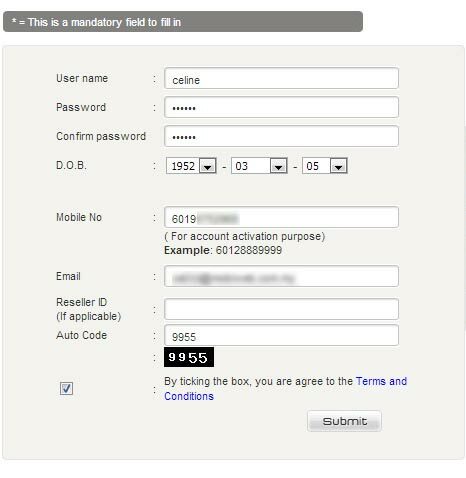 With this FREE registration, you may reload your iSMS Account HERE and start using our service. You can only access to member page after the registration. To learn how to register for iSMS Malaysia, please follow the steps below carefully. Go to http://www.isms.com.my/register.php and fill in your details accordingly.